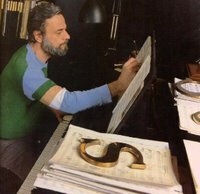 Adventures in the Endless Pursuit of Entertainment: Happy Birthday Mr. Sondheim! BOTH: Move on. Move on. DOT: Stop worrying it your vision Is new. Let others make that decision- They usually do. You keep moving on. GEORGE: Look at what you've done,...Something in the light, Then at what you want, Something in the sky,Not at where you are, In the grass,What you'll be. Up behind the trees...Look at all the thingsYou gave to me. Things I hadn't looked atLet me give to you Till now:Something in return. Flower in your hat.And your smile.I would be so pleased... And the color of your hair. GEORGE: And the way you catch the light.And the care.And the feeling.And the lifeMoving on. DOT: We've always belonged Together! BOTH: We will always belong Together! From the Pulitzer Winning Sunday in the Park with George, music and lyrics by Stephen Sondheim, book by James Lapine. And Maximum Broadway Radio is playing Sondheim all day long!